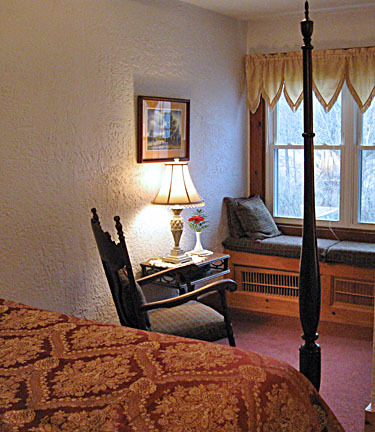 The Inn has 13 guest rooms, all with private baths, air conditioning, and hair dryers. Several rooms have special amenities, such as a private deck, fireplace, two-person spa, or both a spa and fireplace. All rates are for 1-2 persons, per night. 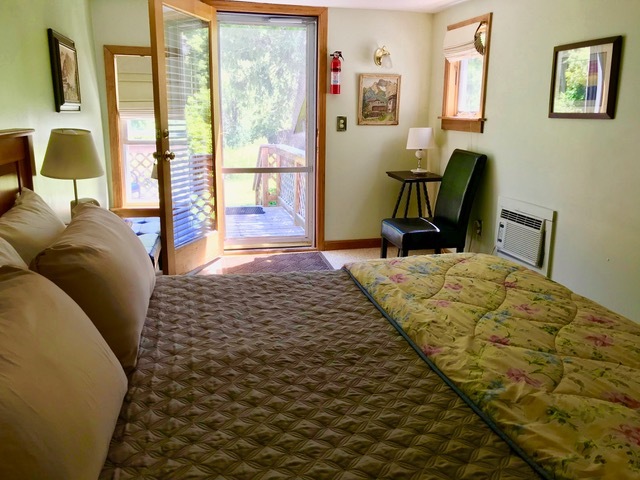 Rates include a full breakfast, afternoon snacks, coffee and tea, use of the outdoor spa, and depending on the season, use of the swimming pool or snowshoes. Certain holiday weekends will require a two or three night minimum stay. Your dog is welcome to join you in the Cottage. 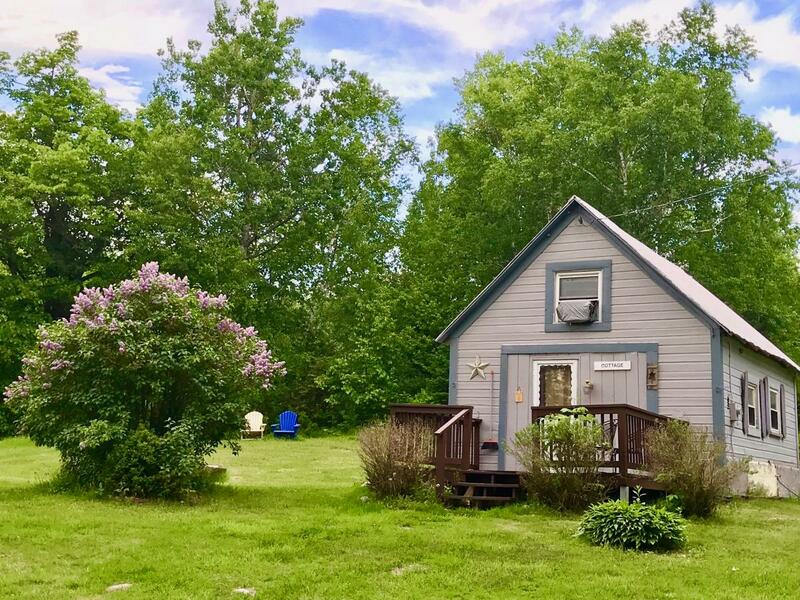 The Cottage can accommodate either one or two dogs. Other pets are not allowed. There is a $30 charge per night for each dog. If you are planning to bring a dog, please review our Dog Guidelines. We would like to welcome SOLO TRAVELERS with a discount of $10 per night! Please let us know on your reservation form that you are a solo traveler. 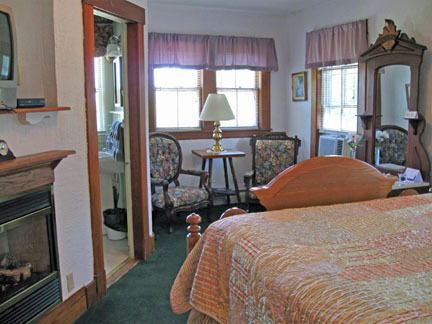 Exceptionally spacious corner room on the 2nd floor of the Main Inn. Queen-size canopy bed, fireplace, 2-person spa, marble shower, lots of windows, views of fields and woodlands, spectacular sunsets. Extra persons are $40 per person per night. Cozy king room along right side of the Main Inn, steps from the outdoor hot tub and pool. Deck with forest views. Deck has five steps. You will need to walk around the building to enter the front door of the Inn to access dining room and common spaces. On the 2nd floor of the Main Inn, facing the front fields. Queen-size bed and 2-person spa. 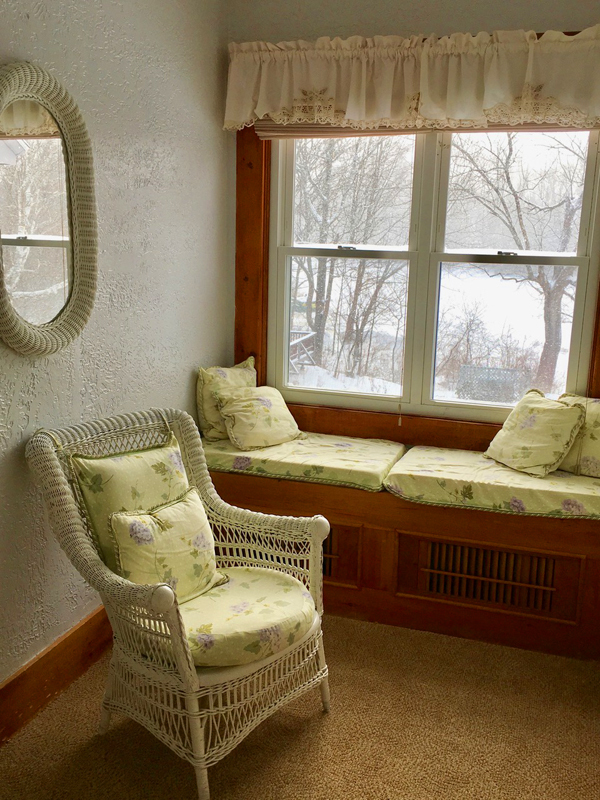 Window seat adds a charming touch. Views of fields and woodlands. Corner room on the 2nd floor of the Main Inn. 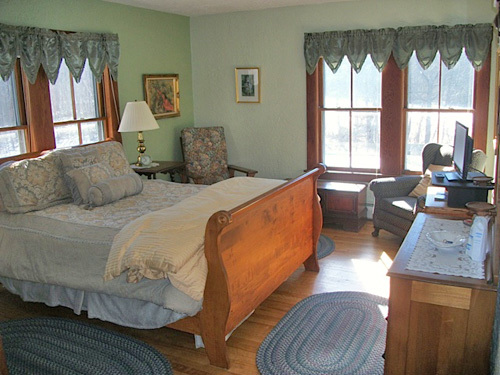 Queen-size bed, fireplace, lots of windows, views of fields, woodlands, sunsets. Cozy in the Winter months, breezy and light in the Spring and Summer. Corner room on the 2nd floor of the Main Inn. 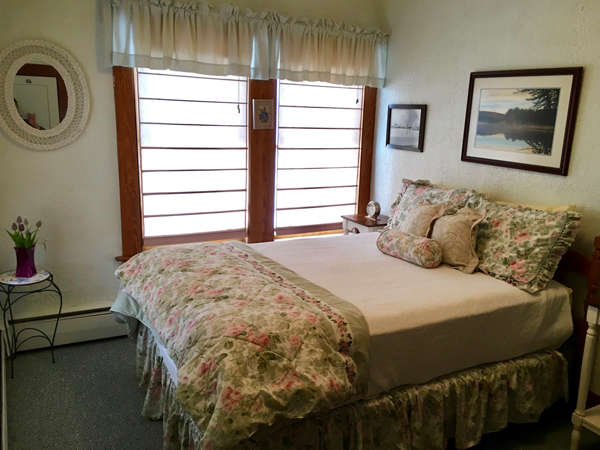 Charming queen-size sleigh bed, tub/shower, lots of windows, views of fields and woodlands. Light and spacious. Cozy queen room along the back of the Main Inn. Small deck with views of sunset and woods. Deck has 9 stairs. You will need to walk around the Inn to enter the front door and access the dining room and common areas. This room is on the 2nd floor of the Main Inn. 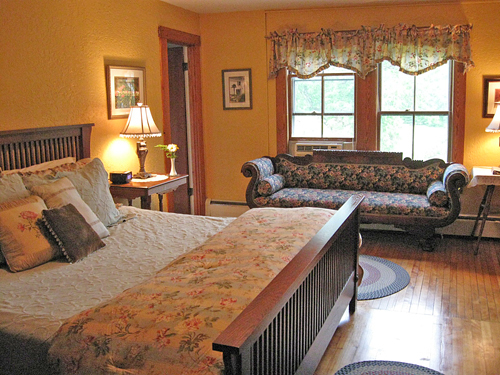 It has a queen-size brass bed, antique sofa (“fainting couch”), original artwork, and views of fields and woodlands. 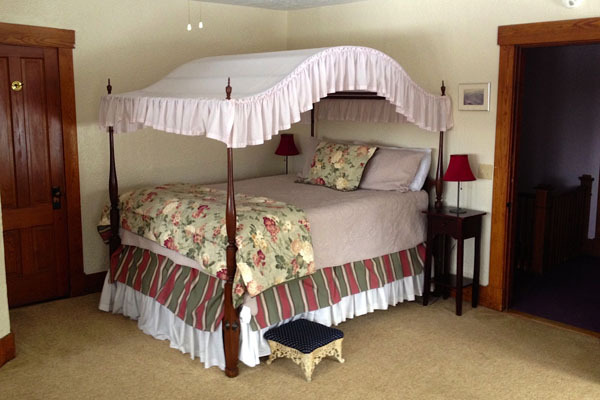 This double bed room is on the 2nd floor of the Main Inn. 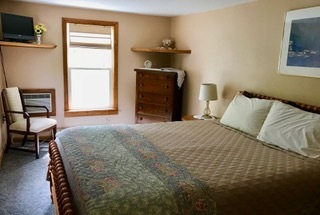 Our comfortable double bed rooms are furnished with one double bed, and are individually decorated with antiques, fine linens, and fresh flowers. This double bed room is also on the 2nd floor of the Main Inn. Our comfortable double bed rooms are furnished with one double bed, and are individually decorated with antiques, fine linens, and fresh flowers. This room has views of the sunset as well as the back fields. This double bed rooms is on the 2nd floor of the Main Inn, facing the front fields. 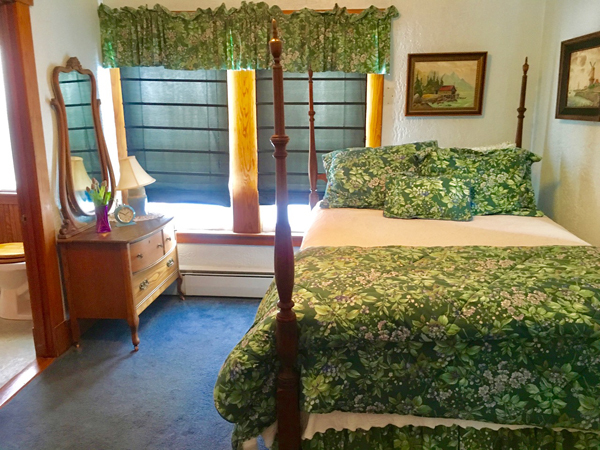 Our comfortable double bed rooms are furnished with one double bed, and are individually decorated with antiques, fine linens, and fresh flowers. 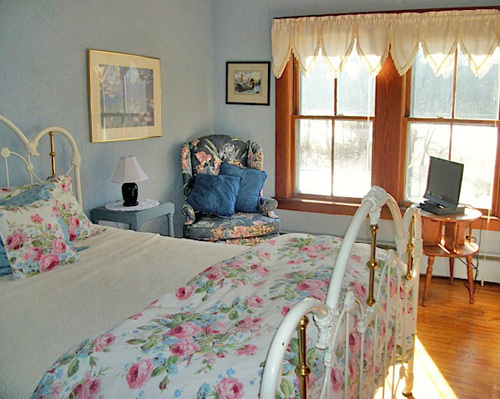 This double bed room is on the second floor of the Main Inn, facing the rear fields. Our comfortable double bed rooms are furnished with one double bed, and are individually decorated with antiques, fine linens, and fresh flowers. This room is best suited to a single traveller or a couple who does not require a lot of space. 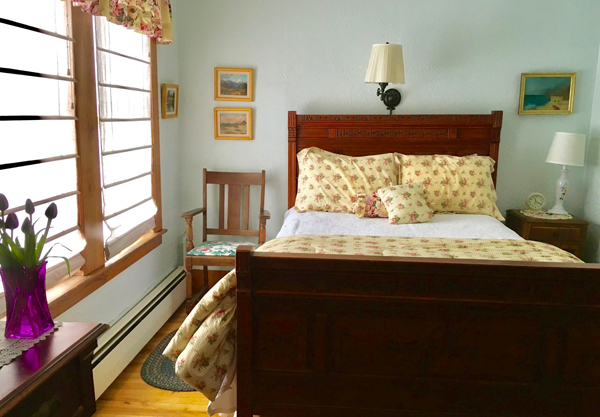 Our rustic cottage is cozy and private. You will enjoy views of fields, forests and sunsets from your private deck. The first floor includes a living area with a sleep sofa, tv/dvd player, microwave, mini refrigerator, small dining table, and bathroom with tub and shower. The second floor is a sleeping loft with queen bed. The Cottage can accommodate one dog. An extra person can be accommodated for $40. The Highlands Inn is a generous annual contributor to many LGBTQ organizations in the United States and Canada. 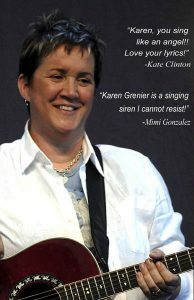 Help Us Support a wonderful local support service agency. 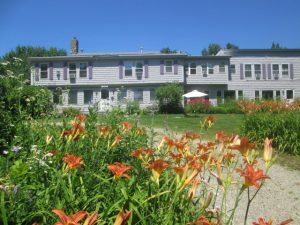 The Burch House provides shelter, direct services and assistance to victims of domestic abuse and sexual violence. When you are packing for your Highlands Inn vacation, please consider bringing a new toiletry item to add to our donation box for The Burch House.